Danish cinema is amazing. In terms of film-making, the Danes are so far ahead of the rest of Scandinavia, it is not even funny. Indeed, they are amongst the very elite in all of Europe. Their actors, directors, screenwriters and the rest of the Danish film industry have not only contributed a great number of outstanding movies over the last few decades, but they have done so on such a scale, that they have helped re-invent and reshape modern film-making worldwide (Dogme anyone?). 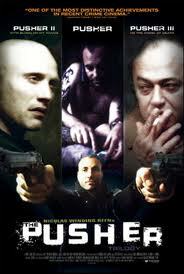 And when diving into the wonderful waters of delightful Danish cinema, the Pusher trilogy is a must see. They are all hard, unforgiving movies, which never try to seduce or sweet-talk its audience, but deliver a realistic and desolate portrayal of the world of desperate dope-fiends, pushers, prostitutes and henchmen. Still they are highly enjoyable experiences, which you will think, and talk about for a long time after you've seen them. The actors... oooh how they are good! Denmark harbors a large gallery of fine actors indeed, but Kim Bodnia is still the reigning king of them all, with Mads Mikkelsen as his renegade prince. In the Pusher films, you get to see them both, do what they do best. A bit of trivia: Director Nicolas Winding Refn somehow managed to convince his producer to film all scenes, in all three films, in chronological sequence. I cannot understand any advantages of making the films this way, other than maybe enabling the actors to have a clearer mindset about what they should express at which times. It must surely have complicated planning and financing at a stupendous level though, which might also have something to do with the films raw, gritty looks. To underline how tragically far behind Norway lies in our film industry, the first Pusher film was horribly ripped off in 2004 by otherwise rather talented Norwegian film-personality Aksel Hennie with his film Uno. But don't bother watching that. See what he stole instead. The original is always best. Yes, the Danes are making some films. I have not seen The Pusher series yet, but I mean too. Loved Bodina in "Old Men with New Cars"